January 21, 2013 (LocalOrg) - There has been a big response regarding the PirateBox mentioned in "WiFi + USB Drive = Your Own Mini-Internet (Freedom)" ranging from mostly excitement to some confusion and many questions in between - especially on how to get involved. The PirateBox is software that can be used to turn your WiFi enabled computer into a local router. It can also be used to make actual "PirateBoxes," which are stand alone devices that likewise create a local network. The advantage of a local network, not connected to the Internet is that you can file share and communicate your way around the draconian restrictions and regulations being increasingly put into place on the Internet. Q: How is this different than my router-based LAN? A: PirateBox doesn't require a router. It takes any device with a WiFi modem, and turns it into the router. This includes mobile devices - meaning that unlike your typical router, it can create a network anywhere you can carry your mobile device - from your home or office, to a train, or even on a jetliner. Additionally, any device wishing to connect to your local network, doesn't need to be configured. The PirateBox network shows up in your WiFi connection list like any WiFi network you would normally encounter (like in a cafe). You simply connect to that network, open your web browser, and the PirateBox interface shows up as your homepage where you can share files and chat inside the browser - users do not need to install or configure anything at all on their computers - and it works across platforms (Apple, Windows, Linux). If you want to connect to the Internet, you simply open up your WiFi connection list again, and pick the network you usually use for the Internet. Switching back and forth takes seconds. Q: So what? So you can make a local network - why should I care? I like the Internet better. A. The Internet still is and will be a useful tool. But if we have the technology to begin hedging the risk of depending entirely on it, we should do so. That is the idea behind using software like PirateBox and mesh networks as inspiration for building a parallel Internet by and for the people, undermining and circumventing efforts by special interests to curb our liberties and freedom. A "collapse" or Orwellian nightmare should not be "prepared for," but instead be prevented by building up a myriad of alternatives that ensure that even in the worst scenario, we have options that avert total disaster. Like segmenting the hull of a ship, by creating alternative communication networks, both centralized and decentralized, we increase our ability to weather a wider range of adversity. Q: How do I install/buy/make a PirateBox? A: Despite the name "PirateBox," the real magic comes from the free software itself. In reality, the most you need is a WiFi capable computer and a USB thumb drive. With this you can download the free software you need and begin using PirateBox today. 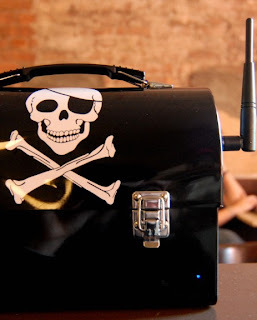 Actual, physical "PirateBoxes" are standalone devices that take the place of your computer. You can make those too. To run PirateBox on your existing computer, follow these instructions here. To make different versions of an actual "PirateBox," follow these instructions here. David Darts has a website dedicated to PirateBoxes and hosts a long list of FAQ's. See them here. Q: I want an instant solution to all my problems. The PirateBox just doesn't deliver on that. A: The mess we find ourselves in was not made overnight, and the solutions to these problems will not come in neat, prepackaged consumer goods or services offering instant answers. We will have to incrementally solve our problems through hard work and determination. Something like the PirateBox is not a final solution. It is one of many small steps we must take to move from total dependency on big-business, to total self-reliance on ourselves and our communities. If hard work and patience is something you are not interested in, then maybe it wasn't freedom you were after in the first place, but rather a more comfortable cage. In that case, investigating the PirateBox, and other means of creating local alternatives for a system that has been co-opted by special interests and turned against us, is not for you. Q. After you make a small local network, what's next? A: Mesh networks, as covered in "Decentralizing Telecom." These operate using similar software that turn each computer on the network into a router. These can cover a much wider area, and usually involve more included software than just a file sharing and chat client. Something even larger than that depends on people getting organized and building it. Q. How else can I get involved? A. The best way to get involved in projects like PirateBox or building mesh networks is to get down to your local hackerspace. If you do not have a local hackerspace, look into starting one. A hackerspace can start with as little as a small group of friends around a single table, working on very simple projects over weekends and evolve from there. Like everything else in life, we cannot be thwarted by the length of our journey by comparing it to the length of our individual strides. Several small steps a day can add up significantly over a year. The alternative is remaining paralyzed in fear or resignation, doing nothing day to day, and at the end of the year, having exactly nothing to show for it. In summation - it is exciting to see so many people interested in a real, pragmatic, tangible solution, no matter how small a solution it may be. It is sincerely hoped that the people who created PirateBox get the recognition they deserve for their clever software and hardware, and get the support from the community to expand on this idea even further.